Featured here for sale is a Sholay movie poster circulated during a very recent screening of the greatest film ever made in Indian cinema. Printed and circulated very recently, this Sholay poster was originally designed for publicity of a recent re-release of the film but never ended up being used. Sholay has an unbeaten record for running for over five consecutive years after being released. The film enjoys a cult following in India and its dialogues are often quoted in various media. It is widely believed that Sholay is the highest grossing Indian film of all time when adjusted for inflation, making this Sholay poster highly collectible! 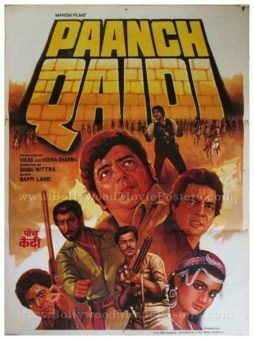 The greatest villain of all time Amjad Khan who plays the iconic character of Gabbar Singh is seen twice in this Sholay poster. Amitabh Bachchan, Dharmendra, Sanjeev Kumar, Amjad Khan, Asrani, Viju Khote, Hema Malini & Jaya Bhaduri Bachchan are seen in this Sholay poster. 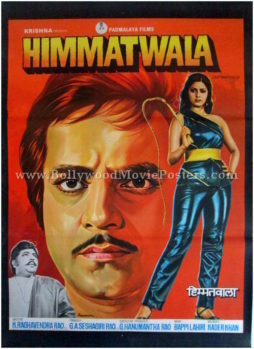 Vintage Bollywood poster for sale of the blockbuster old Hindi film Himmatwala (1983). This is an actual surviving vintage Bollywood poster of the 1983 classic Hindi film that catapulted actress Sridevi into Bollywood stardom. Printed and circulated during the initial first release of the film (somewhere in the early 1980s), this vintage Bollywood poster was originally designed for publicity of the film but never ended up being used. This vintage Bollywood poster for sale features a stunning close up portrait of Jeetendra set against an orange colored background. Sridevi is seen in a hand drawn avatar holding a whip in her hand alongside. Amjad Khan is seen at the bottom of this vintage Bollywood poster for sale in a black and white still photograph. Highly collectible, very rare surviving vintage Bollywood poster of the hit Hindi film Ram Balram (1980) for sale. 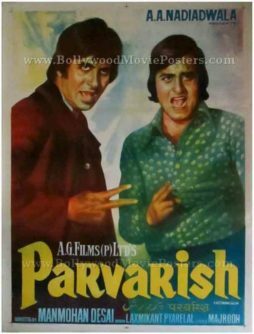 This is an actual surviving six sheet poster of the 1980 film that featured two of the biggest superstars in Indian cinema of the time, Amitabh Bachchan and Dharmendra. Printed and circulated during the initial release of the film, this old Bollywood poster for sale was originally designed for publicity of the film but never ended up being used. This fabulous six sheet poster measures a stunning 120″x60″ inches (approx) in size when its six individual sheets are joined or pasted together. The poster comprises six separate single sheets, each measuring 40″x30″ inches. When pasted together they line up perfectly and together form one single six sheet poster. As shown in the photograph, there may be a slight gap visible between the six sheets – as the images have been photographed individually and then joined together digitally. When framed or pasted, there will be no gap visible between the six sheets and the appearance of the poster would be seamless – i.e. just like a single sheet poster. This poster was originally designed on a hand painted canvas by the greatest and highest paid Bollywood movie poster artist of all time, Diwakar Karkare, making it highly collectible. The poster bears the original signature of Diwakar on the bottom left corner. This beautiful Amitabh Bachchan old movie poster was designed by the most sought after Bollywood movie poster artist in the country. It features highly accurate hand painted renditions of the two key characters in the film – angry young man Amitabh Bachchan and the most handsome Bollywood actor of the time, Dharmendra. Released in 1980, Ram Balram starred Dharmendra as “Ram” and Amitabh Bachchan as “Balram.” Zeenat Aman and Rekha were paired opposite the two, while Ajit, Amjad Khan and Prem Chopra were cast as villains in the film. The film marked the third successful venture of Bollywood’s biggest superstars of the time, Amitabh Bachchan and Dharmendra, who previously were seen in Chupke Chupke and the cult classic, Sholay. Old school Bollywood poster for sale of the Hindi film, Hindustan Ki Kasam (1973). This is an actual surviving vintage Bollywood poster for sale of the 1973 Hindi war movie that was directed by Chetan Anand starring Raaj Kumar in the lead role. Hindustan Ki Kasam was a Bollywood war movie based on “Operation Cactus Lilly” of the Indo-Pakistan War of 1971. Hindustan Ki Kasam is one of the few Bollywood war movies ever made that focus on the role of the Indian Air Force (IAF) in the 1971 Indo-Pakistan war, making this old school Bollywood poster for sale highly collectible. The film is fondly remembered for its opening scene that shows an air raid by Pakistan Air Force (PAF) on an Indian Air Force (IAF) airbase. After the raid Raaj Kumar, an air force pilot, takes an oath while standing near the body of his fallen wingman, “Jawab Dene Aaunga, Is Jawan Ki Kasam, Hindustan Ki Kasam” (I will come to give you a reply; I swear by this fallen soldier; I swear by Hindustan). It was after this key opening scene that the credits of the film appeared with the title song playing in the background. This vintage Bollywood poster was designed and printed for publicity of the film a few years after its original release (somewhere in the late 1970s) but never ended up being used. This old school Bollywood poster for sale was designed by a small time art studio in Delhi. Originally hand painted on canvas, the poster captures the hero of the film, Raaj Kumar brilliantly in three different portraits. 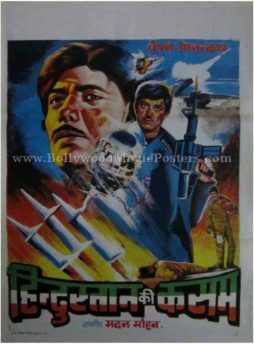 Machine guns, tanks, helicopters and anti aircraft missiles are seen in the background of this old school Bollywood poster for sale. Hand painted Bollywood movie poster of the blockbuster old Hindi film Himmatwala (1983) for sale. This is an actual surviving hand drawn movie poster of the 1983 classic Bollywood film that catapulted actress Sridevi into Bollywood stardom. Printed and circulated during the initial first release of the film (somewhere in the early 1980s), this hand painted Bollywood poster was originally designed for publicity of the film but never ended up being used. This hand painted Bollywood poster contains a stunning close up portrait of Jeetendra set against an orange colored background. Sridevi is seen in a hand drawn avatar holding a whip in her hand alongside. Amjad Khan is seen at the bottom of this old hand painted Bollywood movie poster in a black and white still photograph. 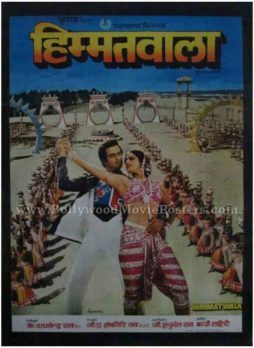 Classic Bollywood film poster of the blockbuster old Hindi movie Himmatwala (1983) for sale. This is an actual surviving old Hindi film poster of the 1983 classic Bollywood film that catapulted actress Sridevi into Bollywood stardom. Printed and circulated during the initial first release of the film (somewhere in the early 1980s), this classic Indian film poster was originally designed for publicity of the film but never ended up being used. This classic Bollywood film poster contains a stunning still photograph taken from the super hit song in the film “Nainon Mein Sapna.” Jeetendra and Sridevi are seen in an iconic dancing pose prominently in the poster. 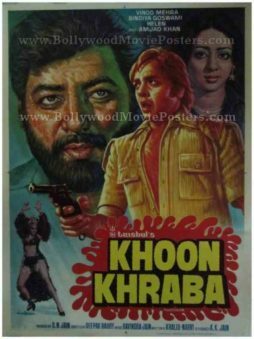 Old Bollywood poster for sale of the classic Hindi film Khoon Kharaba (1980). This is an actual surviving vintage Bollywood poster of the 1980 Hindi film that featured Vinod Mehra and Bindiya Goswami in lead roles. 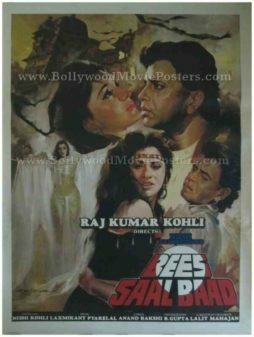 Printed and circulated during the original first release of the film in the late 1970s, this vintage Bollywood poster for sale was printed for publicity of the film but never ended up being used. This old Bollywood movie poster was originally designed in hand painted oil on canvas format by a leading poster art studio in Bombay called Loombarts. The printed signature of the art studio is seen on the bottom left hand corner of the poster. A prominent hand painted portrait of lead actor Vinod Mehra holding a pistol is seen at the center. Brilliant highlights, typical of old school hand painted Bollywood posters are seen over his face. Actress Bindiya Goswami is seen in the background alongside. A large close up portrait of actor Amjad Khan appears on the left displaying highlights of green in this old Bollywood poster for sale. Helen is seen in her typical cabaret dancing avatar at the bottom. The title of the film appears in yellow, encased in blood splatters, giving away the violent plot. 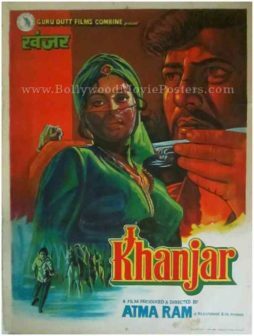 Old Indian movie poster for sale of the classic Hindi film Khanjar (1980). This is an actual surviving Indian film poster for sale of the 1980 Hindi film that was produced and directed by Atmaram and starred Navin Nischol, Reena Roy, Suresh Oberoi and Amjad Khan in prominent roles. Printed and circulated during the original first release of the film (somewhere in the late 1970s), this old Indian movie poster for sale was designed for publicity of the film but never ended up being used. This old Indian film poster was originally hand designed in oil on canvas format by an art studio in Bombay. A stunning hand painted portrait of actress Reena Roy wearing a veil is seen at the center of this vintage Indian poster for sale. A larger close up portrait of Amjad Khan is seen on the right painted in a shade of bright red. Spectacular brush work is evident in the depiction of an action scene at the bottom. A combination of green, blue and red colors used in the design of this old Indian movie poster give it a very catchy appearance. 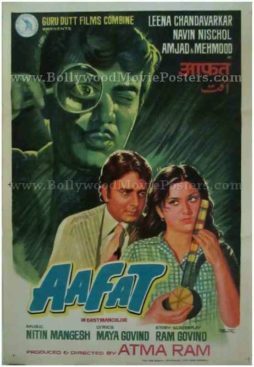 Old Hindi film poster for sale of the Bollywood movie, Aafat (1977). This is an actual surviving old Hind film poster of the 1977 Bollywood movie that featured Navin Nischol, Leena Chandavarkar and Mehmood in lead roles. Printed and circulated during the first release run of the film (late 1970s), this old Hindi film poster was designed and printed for publicity of the movie but never ended up being used. This classic Hindi film poster for sale was originally designed in hand painted oil on canvas format by one of the finest Bollywood poster painters of his time, V.G. Parchure of Pamart studio fame. His printed signature in the name of his art studio appears on the bottom right hand corner of this old Hindi film poster. True to master Bollywood poster painter V.G. Parchure’s trademark style, this old Hindi film poster features stunning hand painted imagery. A large hand painted close up portrait of Mehmood is seen prominently on the top of the poster. Holding a magnifying glass in his hand, his face appears painted in a brilliant shade of green. Smaller hand painted portraits of Navin Nischol and Leena Chandavarkar are seen at the bottom of this old Hindi film poster for sale. 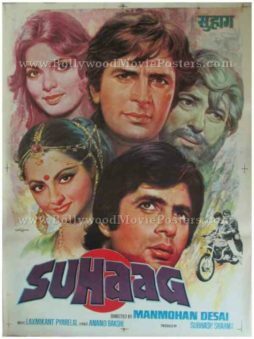 Old Amitabh Bachchan movie poster of the blockbuster Hindi film, Suhaag (1979) for sale. This is an actual surviving old Bollywood movie poster of the 1979 film starring the biggest superstar of Indian cinema, Amitabh Bachchan in the lead role. Printed and circulated shortly after the first release of the film (somewhere in the late 1970s / early 1980s), this old Amitabh movie poster was originally designed for publicity of the film but never ended up being used. This old Amitabh movie poster was originally designed in hand painted format using oil paints on canvas by master Bollywood poster designer, Vasudeo. Stunningly realistic hand painted portraits of the lead actors Amitabh Bachchan, Shashi Kapoor, Rekha, Parveen Babi and Amjad Khan are seen in this old Bollywood poster. The original angry young man of Bollywood, Amitabh Bachchan is seen riding a motorcycle (with Shashi Kapoor riding pillion) on the bottom right hand corner of this old Amitabh movie poster. The printed signature of Bollywood poster painter Vasudeo is seen on the bottom left of this Amitabh Bachchan old movie poster. Suhaag is a 1979 hit Bollywood movie directed by Manmohan Desai. Songs from the film, particularly “Atthara Baras Ki Tu Hone Ko Aayi” are fondly remembered and played till today. 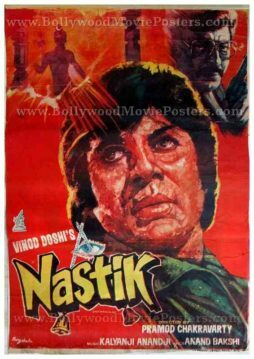 Old Amitabh movie poster of the Bollywood film, Nastik (1983) for sale. This is an actual surviving vintage Bollywood movie poster of the 1983 film that starred the greatest superstar of Indian cinema, Amitabh Bachchan. Printed and circulated during the first release of the film (somewhere in the early 1980s), this old Amitabh movie poster was originally designed for publicity of the film but never ended up being used. Originally designed by a Bollywood poster painter in oil on canvas format, this old Amitabh movie poster features stunning hand painted artwork. A large hand painted close up portrait of superstar Amitabh Bachchan is seen prominently on the side. A stunningly realistic portrait of Hema Malini appears at the center of this old Amitabh movie poster. Actors are Pran and Amjad Khan are seen in smaller avatars at the bottom. 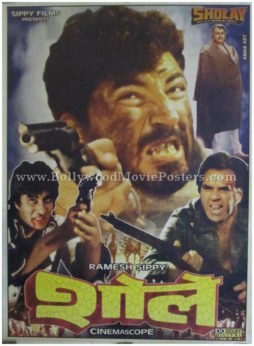 A key action scene from the film is seen on the top of this dramatic old Amitabh movie poster. 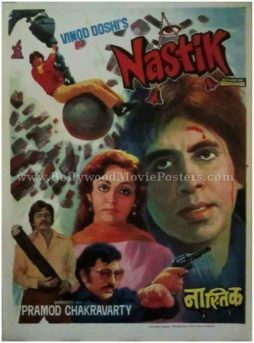 Nastik is a 1983 Bollywood action drama starring Amitabh Bachchan, Hema Malini and Pran in lead roles. 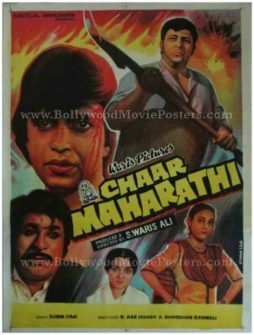 Classic hand drawn movie poster of the Hindi film, Chaar Maharathi (1985) for sale. This is an actual surviving hand drawn Bollywood poster of the 1985 action Hindi movie that starred Mithun Chakraborty in the lead role. Printed and circulated during the first release of the film (somewhere in the mid 1980s), this hand painted Bollywood movie poster was originally designed for publicity of the film but never ended up being used. This classic hand painted Bollywood poster features a quirky hand painted portrait of Mithun Chakraborty. The poster is set against a fiery background to match its action packed theme. Smaller hand drawn portraits of Tina Munim, Amjad Khan, Kader Khan and Asha Parekh are seen lending a very quirky appearance to this old hand painted Bollywood movie poster. 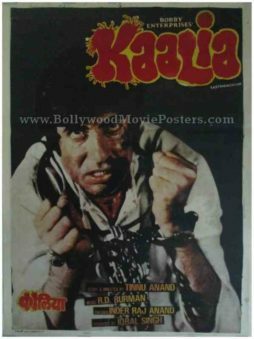 Old Amitabh movie poster of the memorable Hindi film, Kaalia (1981) for sale. This is an actual publicity poster of the 1981 Hindi film that featured the greatest superstar of Indian cinema, Amitabh Bachchan in the lead role. Printed and circulated a few years after the first release of the film (somewhere in the late 1980s), this Amitabh Bachchan movie poster was originally designed for publicity of the film but never ended up being used. Kaalia is remembered for featuring one of the greatest Amitabh dialogues of all time, “Hum Jahan Khade Hote Hain Line Wahi Se Shuru Hoti Hai,” making this poster highly collectible! A song from the film, “Jahan Teri Yeh Nazar Hai” sung by Kishore Kumar (featuring a dancing Amitabh Bachchan) became a rage throughout the nation and is played till today. Old Amitabh movie poster of the blockbuster Hindi film, Laawaris (1981) for sale. Laawaris broke all time box office collection records for its time and was declared a “blockbuster,” making this Amitabh Bachchan old movies posters, highly collectible! Laawaris featured hit songs like “Mere Angene Mein” and “Apni To Jaise Taise” which are played till today. 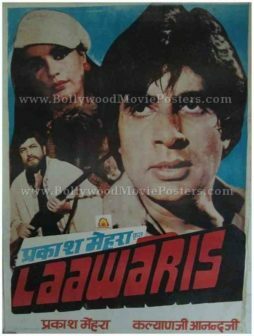 Laawaris (1981) is a blockbuster Bollywood movie directed by Prakash Mehra starring Amitabh Bachchan, Amjad Khan, Zeenat Aman and Raakhee in lead roles. The film became a rage throughout the nation for its hit song “Mere Angene Mein” sung by none other than superstar Amitabh Bachchan himself. Old Amitabh poster of the Bollywood film, Nastik (1983) for sale. Printed and circulated a few years after the first release of the film (somewhere in the late 1980s), this old Amitabh movie poster was originally designed for publicity of the subsequent re-release of the film but never ended up being used. This old Bollywood poster features quirky hand painted artwork. A large hand painted portrait of superstar Amitabh Bachchan is seen prominently on the poster. An idol radiating divine light is painted at the top, giving away the underlying theme of the film. This poster has been paper backed, i.e. glued on thick poster paper in order to safeguard it from wear and tear. 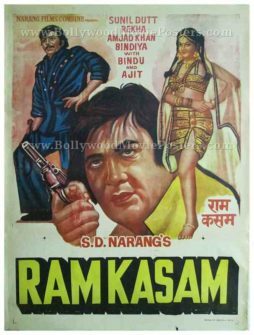 Old hand painted Bollywood movie poster of the Hindi film Ram Kasam (1978) for sale. This is an actual surviving old hand painted Bollywood poster of the 1978 film that starred Sunil Dutt & Rekha in lead roles. Printed and circulated a few years after the first release of the film (late 1970s / early 1980s), this vintage hand painted Bollywood movie poster was originally designed for publicity of the film but never ended up being used. This old Bollywood poster was originally designed on a hand painted canvas by a small time art studio in Delhi, giving it a very quirky appearance. In this quirky old Bollywood poster, Amjad Khan is seen in a hand painted portrait on the left. Rekha appears on the right whereas a large close up portrait of Sunil Dutt holding a gun is seen at the bottom. Hand painted old Bengali movie poster of the classic Indian film, Bandi (1978) for sale. This is an actual surviving vintage Bengali movie poster of the 1978 film that featured Bengali superstar Uttam Kumar in the lead role. Utpal Dutt and Amjad Khan also starred in this film. Printed and circulated during the first release of the film (somewhere in the late 1970s), this old Bengali movie poster was printed for publicity of the film in Kolkata but never ended up being used. This poster was originally designed in hand painted oil on canvas format by a small time art studio in Kolkata, making this poster highly collectible. The design of this hand painted old Bengali movie poster features a stunning portrait of Bengali star Uttam Kumar holding a sword. 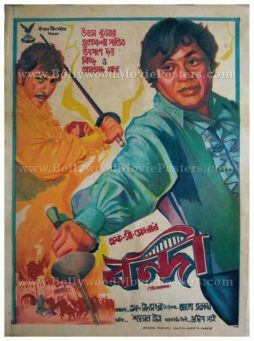 Amjad Khan is seen in the background, also holding a sword in this rare old Bengali movie poster for sale. Original vintage six sheet movie poster of the epic Hindi film Sholay (1975) for sale. Featured here for sale is an original Sholay poster circulated during the film’s initial release run. Considered the greatest film ever made in Indian cinema, this original Sholay movie poster was probably printed somewhere in the late 1970s. 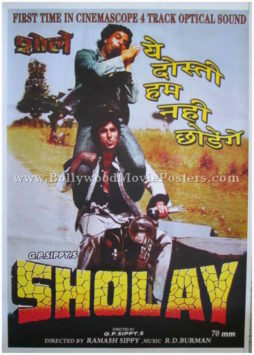 Originally designed for publicity of the film, this original Sholay poster never ended up being used. This original Sholay poster was initially designed in hand painted oil on canvas format. The poster announces, “The Greatest Star Cast Ever Assembled! The Greatest Story Ever Told” on the top. The title of the film is seen painted prominently in an iconic 3D styled font on this original Sholay poster. Portraits of the film’s six lead characters are seen inside individual boxes at the bottom. Original vintage Bollywood poster of the box office hit, Naseeb (1981) for sale. This is an actual surviving vintage Bollywood poster of the 1981 super hit film that starred the greatest superstar in Indian cinema, Amitabh Bachchan in the lead role along with the Dreamgirl of Bollywood Hema Malini. The large stellar star cast of the film also included stars such as Rishi Kapoor, Shatrughan Sinha and Reena Roy, among others. Naseeb was a runaway success at the box office, making this poster highly collectible! Printed and circulated a few years after the first release of the film (Mid 1980s), this old Amitabh movie poster was originally designed for publicity of the film but never ended up being used. This poster has been graded as ★ As Is due to a small hole clearly seen in the adjoining photograph (on Rishi Kapoor’s raised tennis shoe). This hand painted Bollywood poster features quirky hand drawn artwork along with pasted photographic stills. Originally designed by the highest paid Bollywood poster painter of all time, Diwakar Karkare, this old Amitabh poster features a combination of both hand painted as well as photographic artwork. The poster features a still photograph of Hema Malini riding a motorcycle on the top. Rishi Kapoor appears running alongside. Hand painted faces of superstar Amitabh Bachchan and Shatrughan Sinha are seen at the bottom. Bollywood poster artist Diwakar’s printed signature is seen on the bottom left of this beautiful old Amitabh movie poster. 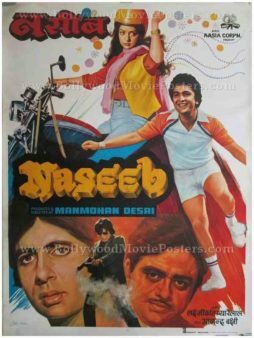 Naseeb is a 1981 Bollywood movie produced and directed by Manmohan Desai. The film starred the greatest actor in Bollywood of all time, superstar Amitabh Bachchan in the lead role along with a large star cast comprising Hema Malini, Rishi Kapoor, Shatrughan Sinha, Reena Roy, Kim, Pran, Kader Khan, Amjad Khan, Prem Chopra and Amrish Puri. The film’s music composed by Laxmikant Pyarelal was a massive success. Songs from the film, such as “John Johnny Janardan” sung by Mohammed Rafi and “Mere Naseeb Mein” sung by Lata Mangeshkar are played till today. The film’s success spawned two regional remakes, in Tamil and Telugu respectively. The film also had cameos from several stars such as Raj Kapoor, Shammi Kapoor, Randhir Kapoor, Dharmendra, Rajesh Khanna, Rakesh Roshan, Waheeda Rehman, Sharmila Tagore, Mala Sinha and Simi Garewal. 2014 re-release movie poster of the epic Hindi film Sholay (1975) for sale. On January 3rd, 2014, an enhanced 3D version of Sholay was released in theaters. 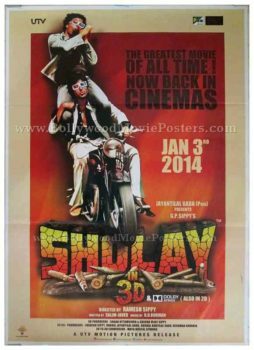 This is an original movie poster circulated during the enhanced 3D release of Sholay – the greatest film ever made in Indian cinema. Printed and circulated in 2013, this poster was originally designed for publicity of the 3D release of the film but never ended up being used. Yeh Dosti (This Friendship) was one of the most popular songs from the epic Bollywood movie Sholay. This Bollywood movie poster features a photo still from the song. Amitabh Bachchan & Dharmendra who play the characters of Jai and Veeru respectively are seen in 3D glasses on the poster, inline with the 3D format of the film. Sholay is the highest grossing film of all time in Indian cinema and unanimously regarded as the greatest film ever made in Bollywood. Declared as the “Film of the Millennium” by BBC India in 1999, Sholay is an unforgettable classic that has become almost synonymous with 'masala' in Indian cinema. Its characters such as Jai, Veeru, Basanti, Thakur & Gabbar Singh have been etched into history. The film has an unbeaten record for running for over five consecutive years after being released. Sholay enjoys a cult following in India and its dialogues are often quoted in various media. 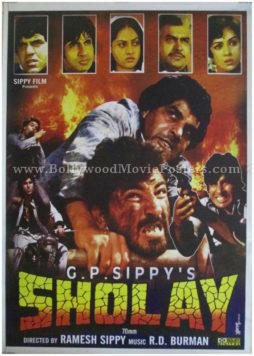 Rare original 30th anniversary release Bollywood movie poster of the epic Hindi film Sholay (1975) for sale. On August 13, 2004, an enhanced version of Sholay was released to coincide with its 30th anniversary in the coming year. This is an original two sheet Bollywood movie poster printed and circulated during the enhanced re-release of Sholay – the greatest film ever made in Indian cinema. Printed and circulated in 2004, this poster was originally designed for publicity of the 30th anniversary re-release of the film but never ended up being used. This poster was localized to be distributed to five select cinema halls in Kolkata, and bears their names on a black strip at the bottom. Sholay is the highest grossing film of all time in Indian cinema and unanimously regarded as the greatest film ever made in Bollywood. Declared as the “Film of the Millennium” by BBC India in 1999, Sholay is an unforgettable classic that has become almost synonymous with ‘masala’ in Indian cinema. Its characters such as Jai, Veeru, Basanti, Thakur & Gabbar Singh have been etched into history. The film has an unbeaten record for running for over five consecutive years after being released. A 3-D version of this film is on its way for release. Sholay enjoys a cult following in India and its dialogues are often quoted in various media. 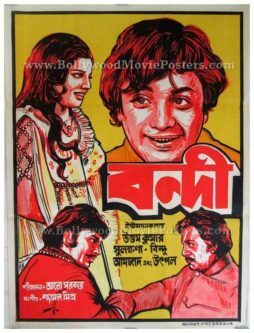 Old hand painted Indian movie poster of the classic Bengali film, Bandi (1978) for sale. This is an actual surviving vintage publicity poster of the 1978 film that featured Bengali superstar Uttam Kumar in the lead role. Utpal Dutt and Amjad Khan also starred in this film. Printed and circulated during the first release of the film (somewhere in the late 1970s), this old Bengali movie poster was printed for publicity of the Bengali release of the film but never ended up being used. This poster was originally designed in hand painted oil on canvas format by a small time art studio in Kolkata, making this poster highly collectible.. The design of this old Bengali film poster captures the star cast in quirky portraits set against a bright yellow background.